The globalisation of markets has pushed static, territorially-bounded legal structures towards a more rapid and efficient adaptation to the globalised and regionalised reality. In addition, substantial modifications in the structure and activities of financial institutions have increased risks and the need for new regulatory responses. 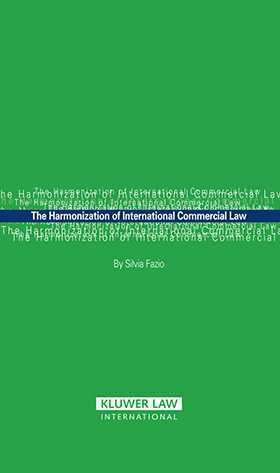 Efforts to harmonise commercial law within the global order have resulted in a fragmented and ad hoc process, constructed according to multiple different interests and in order to preserve public policies in the face of transnational challenges. the role of professional associations such as the International Chamber of Commerce (ICC). A detailed study of the various legal vehicles that promote the spread of international standards emphasizes the influential role of soft law and the emergence of customs alongside the case law developed by the International Court of Justice and the European Court of Justice. Further analysis includes a detailed comparison of the standardisation of company law in the Mercosur and the European Union, demonstrating the evolution of certain regional integration processes into full-fledged legal structures. The synthesis of existing systems and emerging trends presented in this important book will be of immeasurable value to everyone working in the field of international commerce, from business executives and their counsel to policymakers and government officials. It will be consulted by all these professionals for many years to come. Preface. 1. The World Scenario and the Approximation of Law. 2. Vehicles for the Harmonisation of Law. 3. Regionalisation and Standardisation of Law. 4. Regional Corporate Law Harmonisation: The EU and the Mercosur. 5. The Infrastructure of Capital. 6. The Phenomenon of Development: International and Regional Approaches to Banking and Financial Law. 7. Theories of the Company. 8. Corporate Governance. 9. International Legal Standards and the Inclusion of Emerging Countries in the Globalised Order: The Case Study of Brazil. 10. Conclusion: Legal Pluralism and the Creation of Standards within the Process of Globalisation Analytical Summary and Theoretical and Practical Implications. Bibliography.